These short ribs are browned and baked with rice. The rice and vegetables are added halfway through the baking, making a whole meal. In a heavy skillet, cook short ribs for about 30 minutes, turning frequently to brown all sides. Season short ribs with salt and pepper. 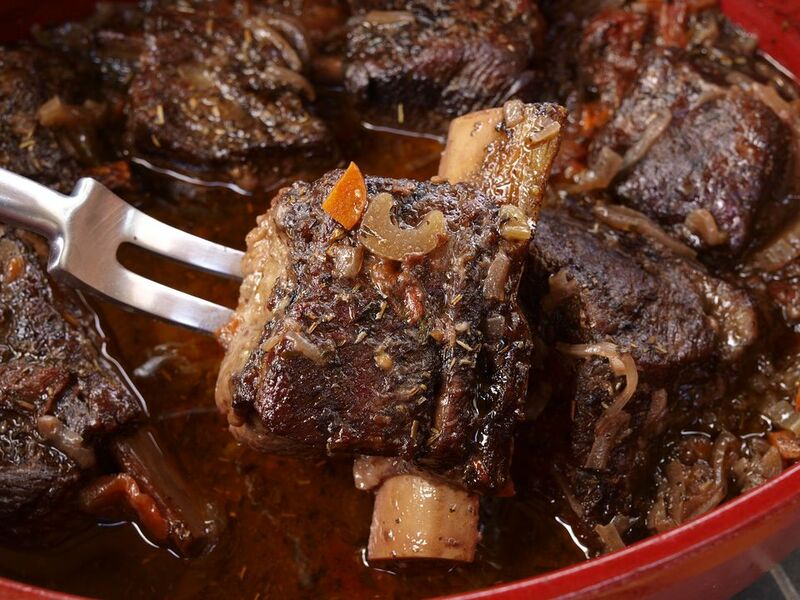 Transfer short ribs to a large baking dish or casserole. Cover and bake at 325 F for 1 hour. In the same skillet, combine rice, onion, celery and green bell pepper; cook until rice is browned lightly. Remove ribs from oven after baking 1 hour; drain. Remove short ribs from baking dish. Place rice and vegetable mixture in the casserole then top with the short ribs. In a saucepan, combine beef base, Worcestershire sauce, thyme, 2 1/4 cups water, 1 1/2 teaspoons salt, 1/8 teaspoon pepper; bring to a boil. Pour over the ribs; cover and bake short ribs 1 hour longer.